Construction of the University of Birmingham’s High Temperature Research Centre reached a significant milestone this week as the University and contractor Wates Construction celebrated the development’s ‘topping out’. 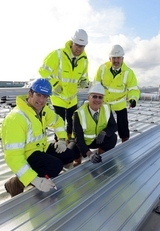 Traditionally held to bring luck to a new building when it has reached its upper-most point, the topping out ceremony took place on site of the £12m development at Ansty Park in Coventry. Representatives from the University marked the occasion by signing the final roof panel which was then put into place at the top of the development. The 5,800 sq m facility will be a unique casting, design, simulation and advanced manufacturing research facility and will focus initially on the key design and manufacturing aspects of investment casting when complete, which is scheduled for Spring 2015. Alongside the High Temperature Research Centre, Wates is concurrently delivering the new £9m Aerospace Research Centre on behalf of the Manufacturing Technology Centre (MTC) and MTC’s £14m Advanced Manufacturing Training Centre. Together, the three R&D schemes will position Ansty Park as a ground-breaking new home for innovation excellence as part of an ambitious £90m expansion.